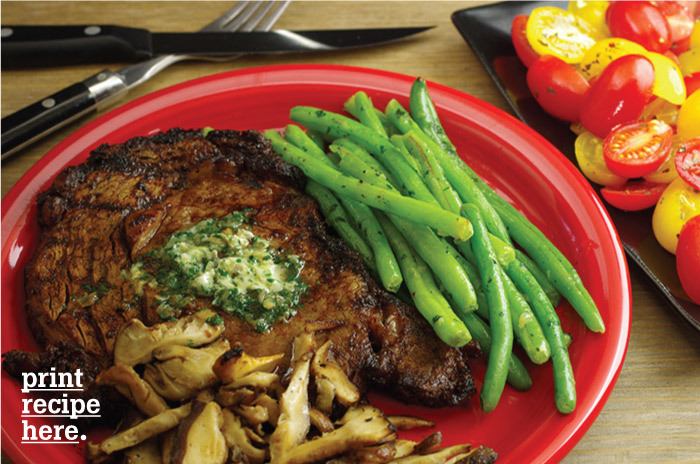 The rib-eye steak is the favorite of many a meat eater. Marbling is what makes a steak juicy and tender, and the rib eye has more marbling than any other cut. If you prefer the boneless version go ahead and make the substitution here. I just prefer the flavor of any steak cooked on the bone. 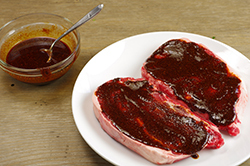 A chile powder-based wet rub goes on these steaks and it’s a wonderful match with the rich taste of the beef. Be sure to get a good quality chili powder. I like the San Antonio Red that I get from Pendery’s, but there are many other good ones as well. When it comes to chili powder, it’s best to look beyond the supermarket. Topping the chili-rubbed rib eye with the Cilantro Butter gives it a nice cooling feel in your mouth. These would go very well served with green chili cornbread and pinto beans. 1. At least a few hours and up to 1 month before you plan to cook, make the butter. 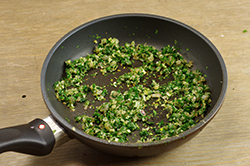 In a small skillet over medium heat, heat the oil. 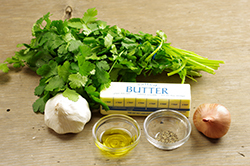 Add the cilantro, shallot, and garlic and cook for 2 to 3 minutes, stirring often, until the shallot is soft. Transfer to a bowl and set aside to cool. In a medium bowl, cream the butter with a fork. Add the cilantro mixture and blend well. Transfer to a 12-X-12-inch sheet of waxed paper and form into a log about 8 inches long in the center of the sheet. 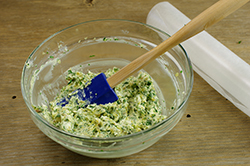 If the mixture is too warm to handle, just refrigerate for a couple of minutes until it is ready. 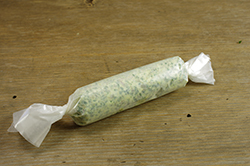 Roll the butter up in the waxed paper to make a firm log and twist the ends to hold it tight. Place in the freezer until firm. 2. One hour before you plan to cook, make the rub. 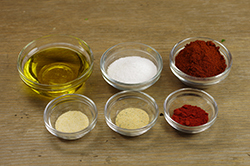 In a small bowl, mix together the chili powder, salt, granulated garlic, onion powder, and smoked paprika. Add the oil and mix well. 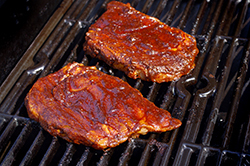 Place the steaks on a big platter and brush the wet chili rub evenly on both sides on the steaks. Refrigerate until it is time to cook. 3. Prepare the grill for cooking over direct medium-high heat. Place the steaks directly over the cooking grate. Cook for 4 to 5 minutes per side for medium-rare, or to your desired degree of doneness. Remove to individual serving plates and top each steak with a couple of thin slices of the butter. Let rest for 5 minutes before serving. 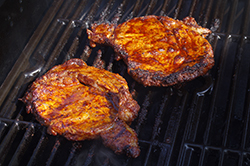 Recipe from Ribs, Chops, Steaks & Wings by Ray “Dr. BBQ” Lampe. Copyright 2009. Published by Chronicle Books, San Francisco, CA. Reprinted with permission of the publisher. All rights reserved.